As we rush headlong toward Publication Day next Tuesday, September 5, here’s a peek at one part of the book you haven’t seen yet: the back cover. 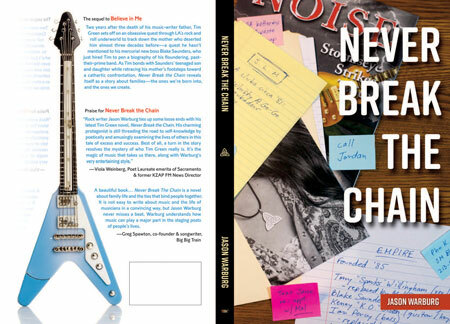 If you’ve read the excerpt we shared earlier this week, you’ve already met the guitar featured above. The conventions of dramatic form would suggest that a notable object introduced in the early going is fated to reappear later in the story; more I cannot say. In the meantime, it’s a pleasure to share the pair of quotes featured on said back cover, from two of my own favorite artists. First is the poet Viola Weinberg, who in addition to being past Poet Laureate of the City of Sacramento, used to hang out with the rock stars while working at KZAP, Sacramento’s original free-form radio station. Next is Greg Spawton, co-founder, songwriter and bassist for Big Big Train, the stupendously talented British progressive rock collective. Each contributed to this book in ways beyond description. Thanks to Viola and Greg for their kind words, and also to each of you who have asked “How can I help?” The answer is simple: when you see posts promoting the book next Tuesday and beyond, share them with your own friends and networks. And then later on, if you’re so inclined, leave a review the book’s Amazon page. Like so many things in this social media age, it’s all about word of mouth. Thank you, thank you.